It is late summer and I love coming across the red stalks of rhubarb at the grocery store or farmers market. I have amassed a collection of recipes for sweet crumbles, tarts, turnovers, ice cream and fools as well as several savory recipes for pork and chicken. I was feeling the need for sweet but also to be sort of healthy, so I went with a Rhubarb-Strawberry Crunch. The mix of sweet strawberries and sour rhubarb, with the oats to give it body was just what I was craving. Just look at this color – doesn’t it make your mouth water? 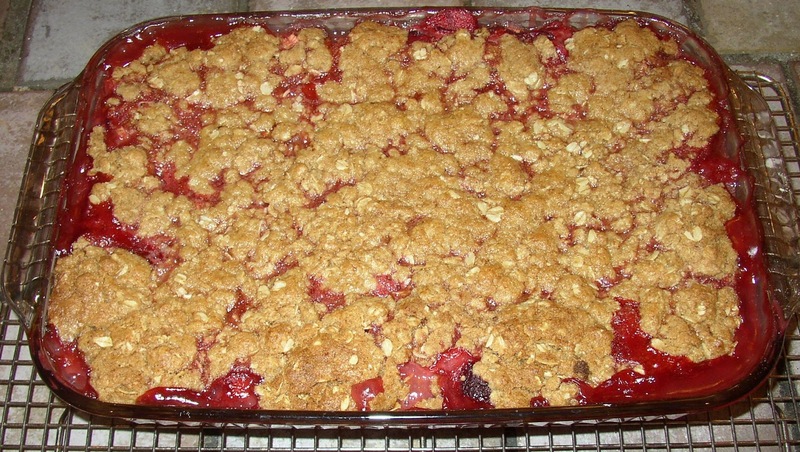 In a large bowl, mix together sugar, 3 tablespoons flour, strawberries, and rhubarb. If using frozen fruit, add an additional tablespoon of flour. Pour the mixture in a 9×13 inch baking dish. Mix remaining flour, brown sugar, butter, and oats until crumbly. Spread on top of the rhubarb and strawberry mixture. Bake 45 minutes in the preheated oven, or until crisp and lightly browned on top. Lively Freret Street is not just for dinner anymore. These days, along the busy street can be found a number of cool nightspots like Cure, a New Orleans Cocktail Bar. They do make it difficult to find, though. There is no sign and the street number (4905) is a bit hard to read when navigating the narrow street and busy traffic. I only had to go around the block once and then I luckily scored a great parking place. I arrived just as they opened and found a great seat, although it did face a humongous poster of a bug. As they didn’t decorate with an insect theme, I’m not sure why it was there but, whatever. Within 20 minutes, the bar was full and by six o’clock on a Friday evening all the other seats were taken and people were standing in the center aisle. Quite the happening place! I started with the server recommended tequila based cocktail with an orange peel that was a nice combination with which to end the work week. 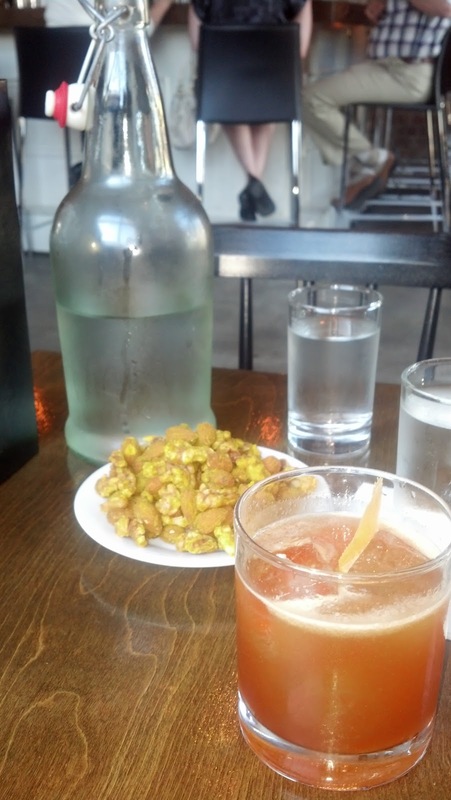 For nibbles, I ordered the Moroccan spiced nuts appetizer. Unfortunately, there were a lot of walnuts in the mix and my mild allergy kicked in so I wasn’t able to enjoy it fully. My friend arrived and barely glanced at the menu before ordering a champagne cocktail. We quickly got down to brass tacks and, in no time at all, we finished our discussion of board business and were able to think about refills and food options. She ordered the Shrimp and Snapper Ceviche served with sourdough crisps that looked very good. I was still full from lunch, so instead of ordering a small plate, I went straight for dessert. 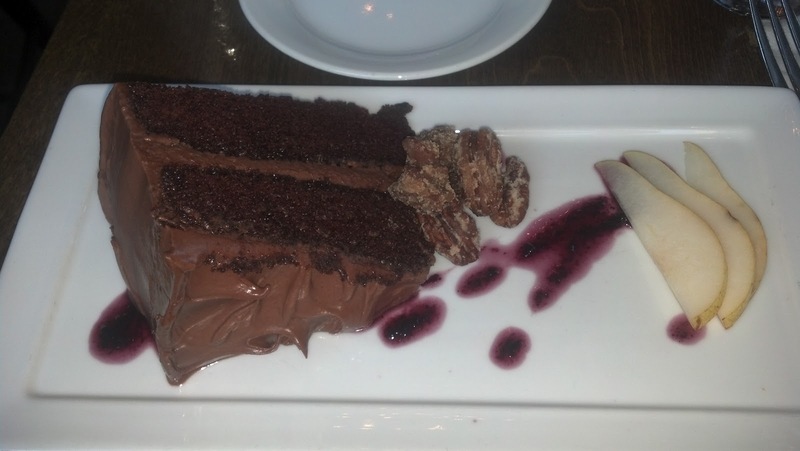 I ordered the Dark Chocolate Layer cake with a glass of Tawny Port. It was a moist, dark cake with a nice frosting that tasted like it had a hint of bourbon. I did eat the candied pecans but left the apple slices on the plate. The server was very busy but she still made enough trips around our area that we never had to look for her. She was knowledgeable of the menu and made good recommendations. Very much a cool place to wind down from work. A bit hip and trendy but the cocktail and wine selection means that there is a drink for every taste. 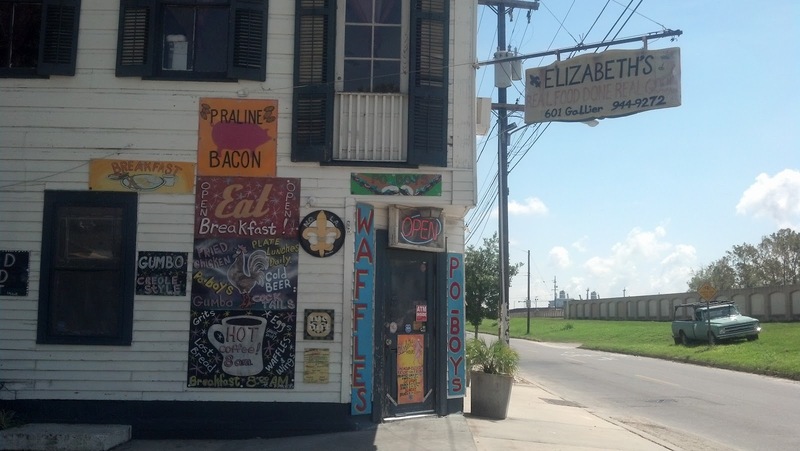 I had a meeting in the Bywater neighborhood with a potential collaboration partner for the LGBT Community Center so we went for lunch at Elizabeth’s Restaurant. I’ve been meaning to get there for breakfast, as they serve Praline bacon (Brown sugar and pecans ground together to make a praline mixture and put on bacon that has been cooked partway. Finish baking the bacon nice and crisp and you’ve got praline bacon). I ordered the BLT. Their twist on the classic sandwich came in a bowl because the ciabatta bread was filled to overflowing with the crisped Hog Jowls, Chopped Tomatoes, Fresh Spinach, Red Onion, Blue Cheese and Champagne Vinegar. My only complaint was that that any bite with hog jowls and blue cheese together was almost too salty. My order came with a side and I ordered the sweet potato fries – crispy outside, soft inside and sweet as sugar. Major yum! My dining companions had Boiled Shrimp Salad and the House Salad with Turkey and Lemon Grass Vinaigrette. Both enjoyed their meal – the shrimp is served head on in addition to the skin, so be prepared for a bit of a mess when you peel ’em. The waitstaff was fast with refills and to check in and the ambiance to diner casual with lots of Dr. Bob’s Be Nice or Leave art for sale. Definitely a place to get Real Food Done Real Good! At 900 Bourbon is the gayest diner in the nation. 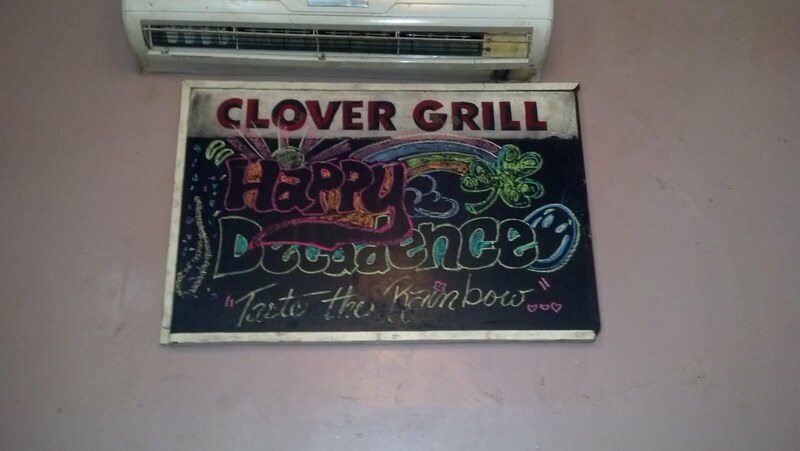 The Clover Grill is open 24 hours and sells the perfect food for when you’ve overindulged. Breakfast is served all day (and night) as well as burgers and other sandwiches. Food may taste better after midnight but, for my visit at lunchtime, the greasy comfort food still hit the spot. 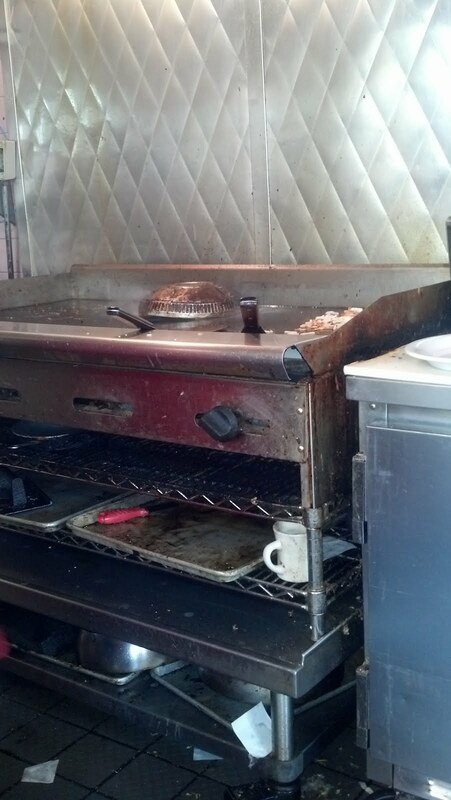 I was by myself so I sat at the counter, where I could watch the magic of short order cooking happen. This is a friendly place, so I got into conversations with the people sitting beside me. I even used my phone to pull up the map for the route of the Southern Decadence parade so the couple to my right who were in town for one more night could go and experience the wonderful Labor Day weekend celebration that is uniquely New Orleans. They claim to have the most delicious hamburgers and I will admit they are very good for the price. The large bun is toasted and the frozen patty is steamed under an hubcap. You can see it in the picture to the left. You can also see that cleanliness is not the highest priority here but most patrons have enough alcohol in their systems that the germs don’t stand a chance. They have all sorts of toppings for the burgers but I stayed with the classic cheddar and bacon. I also got the tater tots with it and they were awesome. You do have to go outside for the restroom (that is itself an experience) but, for French Quarter dining, it has good food, good prices and great character. It is also a great place to people watch along Bourbon.